Houston’s recovery from Hurricane Harvey flooding will be a “multi-year project”, Texas Governor Greg Abbott has said. “This is going to be a massive, massive clean-up process,” he told the ABC News programme Good Morning America. President Donald Trump is to propose an initial $5.9bn (£4.56bn) for recovery efforts, but the Texas authorities say the state might need more than $125bn. More than 40 people have died in the storm and its aftermath. Recovery efforts in Houston are under way as the water recedes but search-and-rescue teams continued their work in the nearby city of Beaumont, Mr Abbott said on Friday. Officials in Beaumont, a city of about 120,000 people near the Louisiana border, said Harvey’s flooding has cut off their drinking water supply. Brad Penisson, a captain with the Beaumont fire and rescue department, said on Friday the city was setting up water distribution stations to ensure residents had clean drinking water. Harvey made initial landfall as a Category 4 Hurricane in Texas last Friday, and has since dumped an estimated 20 trillion gallons of rain on the Houston area. It was later downgraded to a tropical storm but continued to batter Texas with rain. An estimated 93,942 homes in Texas have been damaged or destroyed in the wake of Harvey, according to the Texas Division of Emergency Management. About 80% of Texans do not have flood insurance to cover the wreckage. The storm has displaced thousands and about 32,000 people remain in shelters across the state, Mr Abbott said. 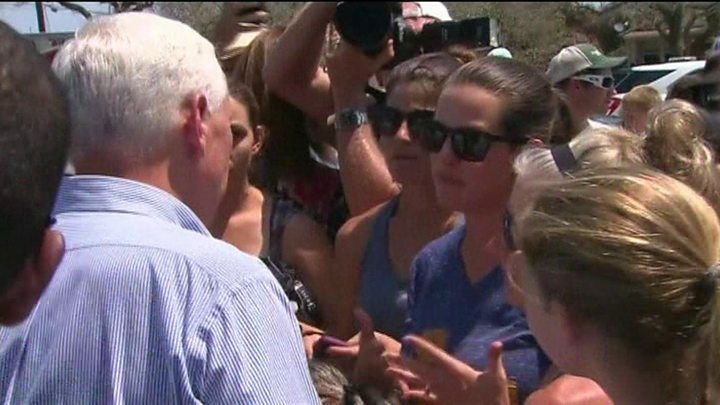 Visiting Texas, Vice-President Mike Pence on Thursday promised federal help to “rebuild bigger and better than ever before”. The BBC’s Barbara Plett Usher in Houston says Congress is expected to act quickly on the request for initial funding when it reconvenes next week after its August recess. But, she adds, that will be only the first tranche of money needed for the recovery. Mr Pence said 311,000 people had registered for disaster assistance. It is not yet clear how quickly funds might reach victims. The White House also said Mr Trump would donate $1m of his own money to the relief effort. Dell Technologies CEO Michael Dell and his wife, Susan, have also pledged to donate $36m to launch a Rebuild Texas Fund with the aim of raising more than $100m for recovery efforts. The couple, both Texas natives, said on Friday they plan to donate $18m immediately to launch the fund through their eponymous foundation. How hard has Harvey hit the local economy? Officials in Harris County, where Houston is located, estimate 30,000 to 40,000 homes have been destroyed in area alone. “We need an army of Fema agents on the ground,” Mayor Sylvester Turner told CNN on Friday. Thousands of homes remain without power. One chemical plant in Crosby, near Houston, caught fire on Thursday, and more fires are expected in the coming days. Residents have been evacuated from the plant in a 1.5-mile (2.5km) radius, and smoke was seen rising from the site on Thursday. President Trump and his wife Melania are expected to return to Texas on Saturday. The president visited the flood-hit state earlier in the week but limited his visit to Corpus Christi, which avoided the worst of the flooding, over fears his presence could divert resources from rescue efforts. Storm Harvey has been downgraded to a tropical depression and is expected to dissipate over Ohio on Saturday evening.